Alan Schwartz, Board Chair is a strategic management and finance professional with over 30 years of experience in the private, governmental and nonprofit sectors. He is the principal of AGS Associates which advises clients on strategic development, restructuring, and financing in the United States and overseas. In addition, Alan is an experienced family wealth management advisor, and serves as a trustee of private trusts and foundations with aggregate assets of several hundred million dollars. Alan has held leadership positions in numerous public entities including: Executive Director of the Architectural Conservation Trust and Historic Massachusetts Inc., and Chairman of the Boston Landmarks Commission. James Moon, Vice Chair, is a partner with the law firm Meland Russin & Budwick, P.A. James is as passionate about Israel as he is about progressive and LGBTQ issues. 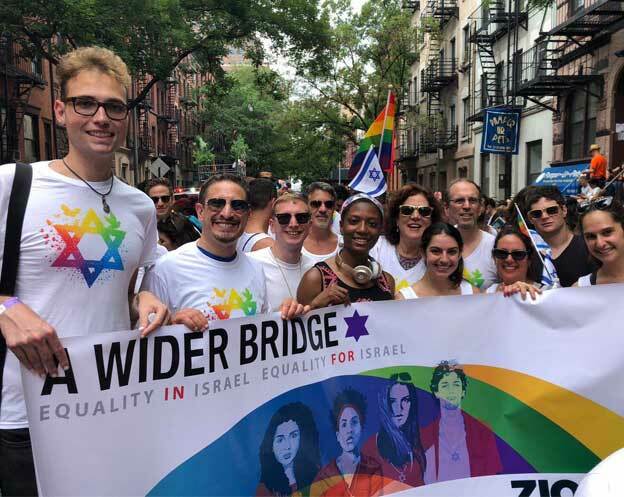 Although he is not Jewish, James makes the case that progressives and LGBTQ in particular can and should support Israel – the only country in the middle east where LGBTQ can find hope for a valued and respected life. James has recognized Israel’s special place in the world since he first learned about it as a boy, and has always found ways to support it, including encouraging his friends and family to buy Israeli goods from Israeli companies to show their support, especially during times when Israel finds itself under attack. James is also currently the chair of the Inclusion Mentoring and Fellowship Committee of the Business Law Section of the Florida Bar which is tasked with diversity outreach to the Florida legal community. James also serves on the board of the MiFo International Gay and Lesbian Film Festival, which encourages a sense of community through international and culturally diverse cinema that offers historical and contemporary perspectives on the gay, lesbian, bisexual, and transgender experience. 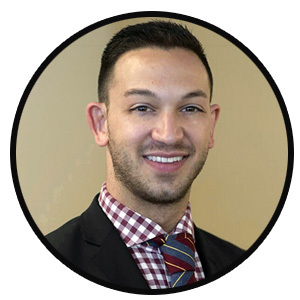 James has been active on boards of various nonprofit organizations over the years and is also a leader in progressive and LGBTQ outreach as a recognized leader within AIPAC. Prior to his legal career, James served for approximately 10 years in the United States Navy aboard both ballistic missile and fast attack submarines as communications and cryptographic specialist and is a Gulf War veteran. Carmella Ettinger, Secretary is currently the managing partner of her family’s residential real estate company. 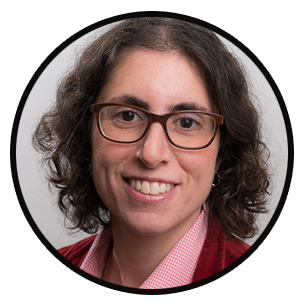 Previously she practiced law in the Portland area including being a member of a feminist law collective serving low-income women. She has participated in Jewish education her entire life including serving on the boards of her son’s Jewish daycare and his Jewish day school. Currently she is the chair of the Overseas Special Projects committee of the Portland Federation. Additionally, Carmella has been very active in the Portland LGBTQ community including serving on the Board of Portland’s Pride celebration for six years with three years as the chair of that organization. Carmella has a lifelong commitment to the State of Israel with all its uniqueness, strengths and weaknesses. She has been traveling to Israel regularly since she was 10 months old. Her father was the 7th generation of her family born in Jerusalem and he is buried on the Mt. of Olives along with several generations of parents, grandparents and great-grandparents. Barry Blecher, Treasurer is a retired actuary who lives in New York City and has served as the chairperson of A Wider Bridge’s New York Metro Council. Barry participated on the 2014 and 2015 A Wider Bridge Israel Missions and has hosted multiple AWB programs in his home. Barry is a member of CBST, where he serves in the synagogue choir. Bruce Maxwell, Past Chair, is a Principal at Arroyo Insurance Services, a commercial insurance agency in the Greater Los Angeles area. Bruce has been a long-time leader in the Los Angeles Jewish and LGBT communities, including serving as President of Congregation Beth Chayim Chadashim (BCC), the nation’s oldest LGBT synagogue and on the Board of the Gay & Lesbian Elder Housing in which he helped to build and open the first ever low-income affordable housing for LGBT seniors in Hollywood, California. 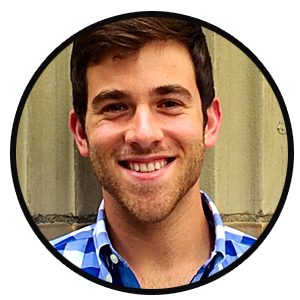 Bruce is a graduate of the University of California at Berkeley, attended a year of his studies at the Hebrew University in Jerusalem and has an MBA from the USC Marshall School of Business. Arthur Slepian, Founder, comes to A Wider Bridge with several decades of experience as a leader in the Jewish community along with a successful career as a leader in the business world. Arthur serves on the Board of Trustees of the Jewish Community Federation of the San Francisco Bay Area, is the Chair of the LGBT Alliance of the Federation and serves on the San Francisco area Jewish Community Relations Council. Arthur has been a leader for more than 15 years at Congregation Sha’ar Zahav in San Francisco, one of the nation’s oldest and largest synagogues serving primarily LGBT Jews, where he served as President from 2003 to 2006, and continues to serve in a variety of leadership roles. Cindy Brown comes to A Wider Bridge with almost three decades of leadership experience in the non-profit sector, including serving as executive director of the MDGLCC Foundation/LGBT Visitor Center, program officer for the United Foundation for AIDS, and director of Miami Beach Pride. Cindy currently runs the Lambda Living Program for LGBT Seniors, a program of Jewish Community Services. Cindy also runs a consulting firm for non-profits, Cenergy LLC, whose numerous local and national clients have included GLSEN, Miami Beach Gay Pride, the Alliance for LGBTQ Youth, and Equality Florida. Her volunteer connections to the non-profit community have been numerous and ongoing, including serving on multiple boards. Cindy currently serves as the Vice Chair of the LGBT Advisory Committee for the City of Miami Beach, the Vice-Chair of the Mayors Elder Affairs Committee for Miami-Dade County, and a board member of the Haitian American Community Development Corporation. A Florida native, Cindy graduated from Miami-Dade College with a music education degree, and the University of Miami with bachelor degrees in both psychology and criminology. Daniel Hernandez is a native Arizonan, lifelong Democrat, and Member of the Arizona State Legislature. He currently serves on the Judiciary and Federalism Committees and is the Co-Founder of the LGBT Caucus. In his first term, Hernandez has received praise for his work to find bipartisan solutions; from introducing a bipartisan resolution in recognition of Israel’s Independence Day. In 2011, while working in the office of Congresswoman Gabrielle Giffords, Hernandez took actions on January 8th with which he is credited with saving her life. That day and the aftermath drove him to advocate for Gun Violence Prevention at the state and national level, which he does to this day. 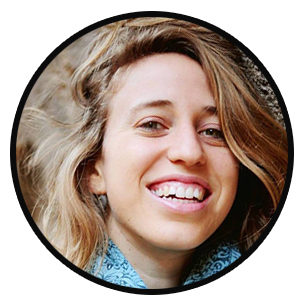 Hernandez is a 2018 Alumnus of the AWB LGBTQ Leadership Mission to Israel. Ron Lezell is a Senior Director with Accretive Solutions, a national financial consulting firm, where he has provided clients with Interim Controller, CFO and finance project work for over 15 years. Ron is a former CPA with Big Four public accounting experience. Ron has a BBA (Accounting) from the University of Michigan and an MBA from Golden Gate University. Frank November an experienced non-profit leader, is a new Israeli citizen, having made aliyah at the end of 2017. Prior, he was both a senior staff member and volunteer leader for two-decades with the Human Rights Campaign. Frank was an instrumental member of the team that designed HRC’s largest-grassroots expansion, leading up to its 2018 midterm election, historic wins. As a fundraising leader, Frank was a part of the team that raised the funds required to build HRC’s headquarters building, a powerful, permanent presence for the community, five-blocks from the White House, and helped lead efforts to grow HRC’s mid-level donor program, the Federal Club. Prior to HRC, Frank was an entrepreneur, worked in corporate strategy & planning in the pulp & paper industry and was a management consultant in the telecommunications industry, working with both manufacturers and end-users. Frank’s active involvement in the Jewish and Zionist communities includes leadership roles with United Synagogue Youth, Hillel, United Jewish Appeal, and a synagogue with outreach to LGBTQ Jews. 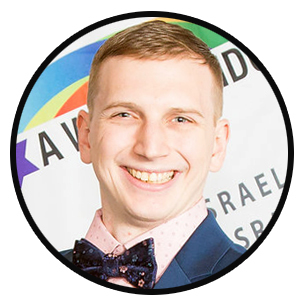 Living in the heart of Tel Aviv, Frank is involved with the TLV LGBT Sports Club, LGBT Olim, and volunteers with the Aguda – The Association for LGBTQ Equality in Israel. 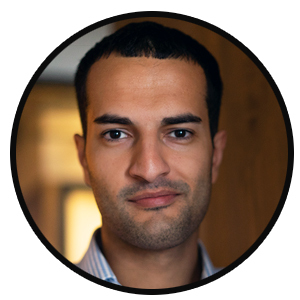 Frank graduated from Ohio University with a Communications degree, earned an MBA from Case Western Reserve University and studied at London Business School. Gil Steinlauf is the Senior Rabbinic Advisor at Congregation Adas Israel, the largest conservative congregation in Washington, DC. Since stepping down from his pulpit earlier this year, Rabbi Steinlauf has consulted for the Conservative Movement and focused on writing. Gil has been involved with the work of A Wider Bridge in Washington for several years. 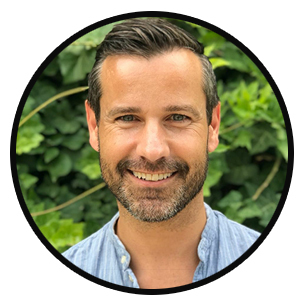 Dylan Tatz is Executive Director of Z Sharp, a San Francisco Bay Area non-profit that provides comprehensive, in-school music education to over 4,000 low-income children in Bay Area elementary schools who would otherwise have no formal music education. His prior positions included serving as an Associate at McKinsey & Co. and as Assistant Director of Strategic Planning at the American Jewish Committee. Dylan earned his M.B.A. from Wharton and his A.B. from Princeton University.